Here we have a UBEC (universal battery eliminator circuit). 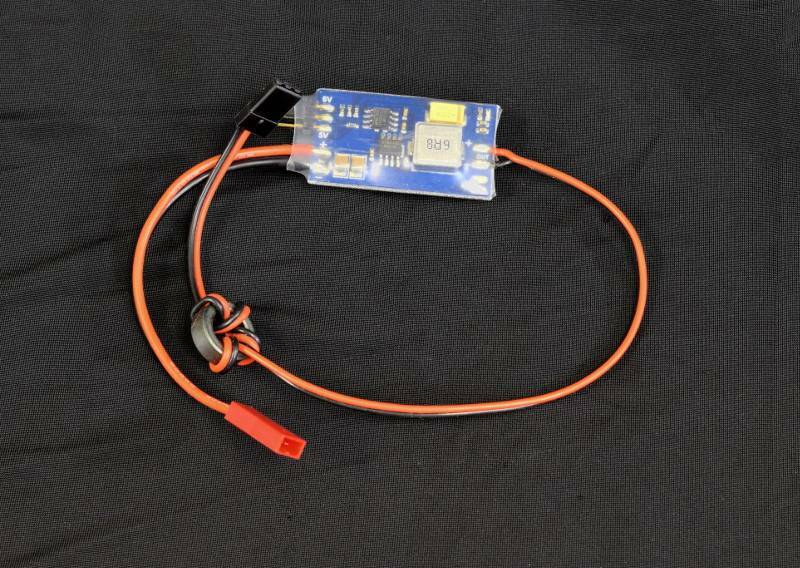 Glider pilots using a UBEC can use a Lipo battery instead of a NiMh to power their radio gear. In power planes the UBEC can be used as a secondary or redundant power supply for the radio gear. With the combination of BEC / ESC's you will loose power to your radio gear if the ESC fails. Using a stand alone BEC gives you a shot at saving the plane if an ESC failure should occur. This UBEC delivers a steady 6 amp output and will deliver up to an 8 amp burst. The output voltage is adjustable to 5 or 6 volts by changing a jumper. The power input connector is a JST and the output lead is a standard servo plug equipped with an electrical noise suppression ferrite bead. Output Voltage 5 or 6 volts. Output 6 amps continuous, 8 amps burst.